A Cuvée Louise off the beaten track. A Cuvée Louise ready to explore every avenue, A Cuvée Louise that has won over the year of 1999 that was full of contrasts. A Year that Louise will never forget. A Year that will be engraved forever in the heart of the wine. The Cuvée Louise 1999 comes in her customary yellow dress with almost golden nuances, proof of the great maturity of the grapes from which she was crafted. She sparkles like a diamond that knowingly attracts the smallest ray of light to discretely refract the bubbles that rise so gracefully and elegantly in the glass. She reveals her natural perfumes, making it perfectly clear that there’s no need to add any others since they are quite capable of delivering a truly outstanding aromatic bouquet. We are in the presence of a rare complexity. Louise generously offers up to us everything she embodies without restraint but with great class. Numerous aromas are unleashed in various registers ranging from mature red berries, over notes of beeswax and freshly dried acacia to flourishes of quince pate, all of them set off by a flourish of minerality that imbues this Louise with generosity and roundness. On the palate, the overall sensation is limpid, clear and without artifice. She is there - for us, only for us, loving and loved, extremely gentle, encompassing the freshness and finesse of silk enhanced by the reassuring warmth of velvet. A Louise without any hint of harshness bearing all the class and distinction of her elders because the blood that flows in her veins is indeed the blood lovingly bestowed on her one day by Madame Louise Pommery. 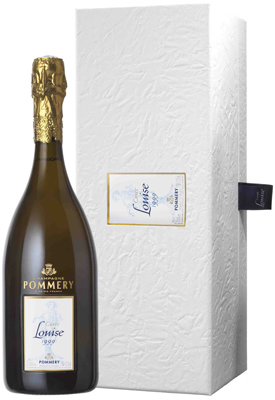 Created as a tribute to Louise Pommery, Cuvée Louise is an absolutely pure wine which quintessentially conveys the wine-making expertise of the Pommery Champagne house. Avize, Cramant and Ay. Cuvée Louise originates in the vineyards of Avize, Cramant and Ay, three “Grands Crus” areas that are jewels in the crown of the Champagne region. The listed and sign-posted Cuvée Louise estates receive regular attention throughout the year. The Avize and Cramant Chardonnay grape and Ay Pinot Noir grape have particularly high sugar content. 200 dedicated pickers, most of them with years of experience, are able to assess the best grapes at a glance. Pressing is performed in a traditional square press close to the vineyards so that the grapes arrive with their properties intact. To ensure that the juices are absolutely pure, for each marc of 4,000 kg only 1,800 litres of juice are selected instead of the authorised 2,550 litres. Pommery is the only Champagne house to have such standards in place. Cuvée Louise is a vintage wine that reflects a single exceptional year. Thierry Gasco, Pommery’s Cellar Master, only decides to produce Cuvée Louise when the year’s harvest is worthy of this great wine. After blending which combines the purity and richness of aromas, the wine begins a period of 6 to 8 years of ageing in our constantly cool chalk cellars. Finally, a dosage is added. This dosage comprises Avize vintages to fully preserve the wine’s character. Pommery ensures that each bottle of Cuvée Louise is stored in a cellar for a further six months to restore the champagne’s natural balance.